Purpose: The purpose of this study was to clarify the difference in foot kinematics, including detailed analysis of the mid- and forefoot, between normal and flat feet. Methods: Forty-six feet of 33 young normal volunteers were participated in this study. All subjects were categorized two groups which were normal foot group and flat foot group. The fifteen color markers were mounted over the anatomical landmarks. Foot motion in a stance with the measurement foot forward, the body weight loaded on the forefoot as much as possible with the lower leg inclined forward and the entire plantar surface in contact with the floor was recorded using four hi-definition digital video cameras. All markers were manually digitized using the Frame-DIAS4 software program (DKH Co. Ltd, Tokyo, Japan). The three directional coordinates of each marker were calculated, and the three directional movements of each marker were compared between normal feet and flat feet using the Man-Whitney U-test. Moreover, discriminant functional analyses were performed on all combinations if significant differences were found between normal feet and flat feet. Results: Normal foot showed medial inclination with maintaining the arch structure, however flat foot showed that forward splaying with collapsed arch structure. Moreover, the forward movements of the cuboid and medial movement of the third metatarsal base may be key movements. Conclusions: It might be important for the treatment of flat feet to control the stability of the lateral longitudinal arch. During locomotion, the foot plays three important roles. The first is to buffer the impact force during the loading response, the second is to maintain stability and support the lower limb, and the third is to assist forward propulsion [1-3]. It will seem logical that changes to foot function may impair locomotion . Flat feet are known to be associated with not only foot overuse problems including metatarsal stress fractures, plantar fasciitis, and Achilles tendinitis, but also knee and leg injuries such as medial tibial stress syndrome, iliotibial friction syndrome and patellofemoral pain syndrome [5-7]. It has been suggested that because the human foot is so specialized, it has limited tolerance for maladaptive disorders such as flat foot, a condition that can lead to changes in muscle functions . Therefore, it is important to improve foot function by performing physical therapy such as muscle strength training of the foot intrinsic and extrinsic muscles, stretching the Achilles tendon, and the use of a foot orthosis. Measurements of three-dimensional foot kinematics in vivo during weight bearing has been performed using a multi-segment foot model, three dimensional computed tomography. Use of a multi segment foot model enabled the measurement of motions such as ground walking, running and jumping without the need for invasive methods. In a flat foot, analysis of three-dimensional foot kinematics during gait using the oxford foot model show that forefoot abduction movement and rear foot pronation movement are increased, while the peak plantar flexion moment increase in the late stance phase . However, the forefoot is measured as one segment in this model, although the forefoot consisted of five metatarsals. Thus, this method has a limitation in that forefoot movements can be measured in detail. Moreover, the human foot is made up of seven tarsals, five metatarsals and fourteen phalanges. These bones, together with soft tissues such as ligaments and muscles, maintain the three arches of the foot. Nester reported that the first, second and third metatarsals had greater stability compared to the fourth and fifth metatarsals, and that the fourth and fifth metatarsals were functionally distinct from the other three metatarsals . Moreover, analysis of patients with flat feet show that the peak plantar flexor moment is increased during the terminal stance phase, and the peak pressure of the medial midfoot was also increased, while that of the lateral forefoot was decreased [11,12]. The terminal stance phase is shown the raising the heel and load on only the forefoot. Therefore, it is necessary to investigate the forefoot kinematics of the flat foot in detail during forefoot loading. The purpose of this study is to clarify the characteristic of the foot kinematics including detailed analysis of the mid- and forefoot during forefoot loading in the flat foot. We hypothesis that both metatarsal and tarsals movement of the flat foot are larger than those of the normal feet. Forty-six feet of 33 young normal volunteers (seventeen males and sixteen females 22.0 ± 4.0 years old) who had provided informed consent were involved in this study. All subjects were categorized into one of two groups: a normal foot group and a flat foot group, using both the Foot Posture Index-6 and a medical history of pain related to flat feet. 26 feet of 21 persons (10 males and 11 Females, 21.0 ± 2.4 years old) constituted the normal foot group in which the height of the medial longitudinal arch was maintained in the standing position without any pain history related to flat foot, and 20 feet of 12 persons (7 males and 5 Females, 23.8 ± 5.6 years old) constituted the flat foot group in which the height of the medial longitudinal arch had collapsed with some pain history related to the flat foot. All subjects were free from lower limb injuries and pain at the time of testing. The 16 flat feet without any pain history and 4 normal feet with some foot pain history are excluded in this study. This study was approved by the ethics committee of our university (2014-078). Fifteen skin color markers were attached over the following anatomical bony landmarks; the five metatarsal heads (MTH1~5) and bases (MTB1~5), the navicular (nav), the cuboid (cub), the peroneal trochlea (cal-l), the sustentaculum tali (cal-m), and the posterior tip of the calcaneus (cal-p). The subjects performed the forward lunge without a stride. 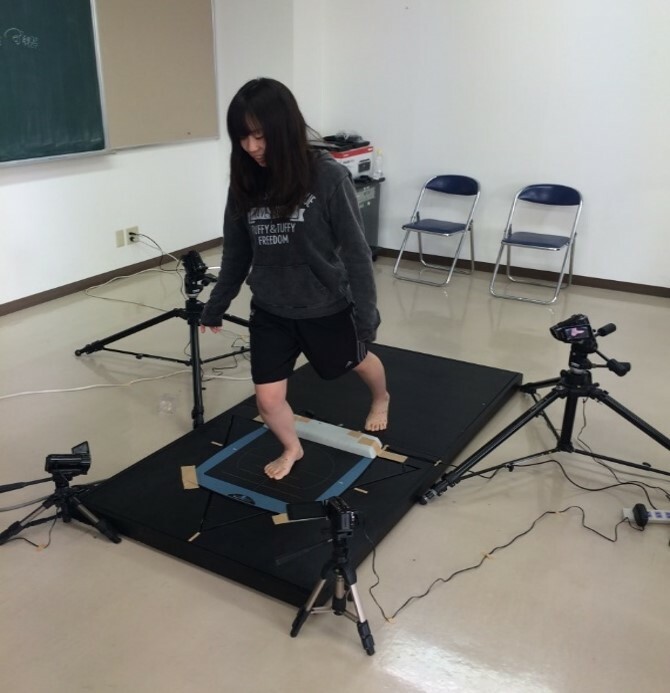 Starting position of the forward lunge involved standing upright with measurement foot stance one step forward onto a sheet censer (Win-pod, Medicapteurs s.a.s., France) which could measure the plantar pressure distribution and set on a force plate(Anima co., Japan). The measurement side of the knee and the ankle slowly flexed until both maximum dorsi-flexion of the ankle and forefoot weight bearing (Figure 1). Subjects were instructed the time of the forward lunge was almost 1second, and enough practice was performed. Forward lunge was performed 3 repetitions. Both whole plantar surface in contact with floor and approximate 70-80 percent of the body weight was loaded on the forefoot were confirmed using the plantar pressure distribution with 180Hz. And the vector of the ground reaction force was confirmed using the force plate with 180Hz. Foot motions during the forward lunge were recorded using four hi-definition digital video cameras (GZ-G5. Victor Co., Tokyo, Japan) with 60Hz. The global coordination frame was set using an acrylic cube with sides of 64.6 millimeters in length, and the direction of movement was represented on the y axis, the position in the vertical direction was represented on the z axis, and the axis at right angles between the y axis and the z axis was represented on the x axis. Figure 1 Forward lunge without stride. The measurement side (right side) of the knee and the ankle slowly flexed until both maximum dorsi-flexion of the ankle and forefoot weight bearing. Both whole plantar surface in contact with floor and approximate 70-80 percent of the body weight was loaded on the forefoot are confirmed using both the plantar pressure distribution and the force plate. All markers were manually digitized and three dimensional markers reconstructed using the Frame-DIAS4 software program (DKH Co. Ltd, Tokyo, Japan). Three dimensional coordinates of each marker were calculated, and low-pass filtered using a Butterworth digital filter with a cut-off frequency of 10 Hz. This method had high accuracy (root mean square error was 0.39 mm) in a pilot study. The three directional coordinates of each marker were calculated, and the three directional movements of each marker were compared between normal feet and flat feet using the Man-Whitney U-test. Moreover, discriminant functional analyses were performed on all combinations if significant differences were found between normal feet and flat feet using SPSS statistics software ver.18 (IBM, Armonk, NY, USA). Figure2 Scatter diagram of the discriminant functional analysis. White rhombus; normal foot, Black circle; the flat foot. Both the MTB3(x) and the Cub(y) were the most powerful variables in distinguishing between normal foot and flat feet foot. Based on these two variables 90.5% of the patients were correctly classified (Wilk’s lambda 0.3; chi-squared 37.7; P < 0.01). If the step height was additionally included in the discriminant analysis, 70% of the flat feet foot were correctly classified. In the medial direction, flat feet are significantly smaller than normal feet at the first, third, and fourth metatarsal head, the first to third metatarsal bases, the navicular and the cuboid. In the forward direction, flat feet are significantly larger than normal feet at the first metatarsal head and base, the second and third metatarsal base, the cuboid and the cal-p. In the vertical direction, flat feet are significantly smaller than normal feet at the first, fourth and fifth metatarsal head, the fifth metatarsal base, the navicular and the cuboid, and larger at the second metatarsal head and cal-p (Table 1). 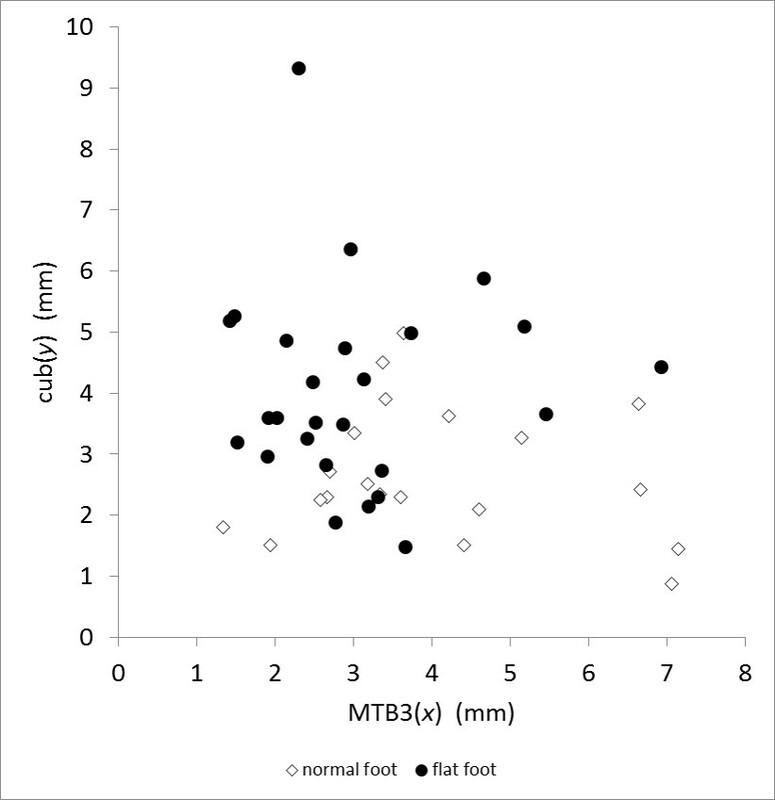 In discriminant analysis, between the groups the cub(y) and MTB3(x) were the most powerful variables in distinguishing between normal feet and flat feet. Based on these two variables 90.5% of the patients were correctly classified (Wilk’s lambda 0.3; kai square 37.7; P < 0.01). If the step height was additionally included in the discriminant analysis, 70% of flat feet were correctly classified (Figure 2). Our results are shown the characteristic of the flat feet and normal feet during the forefoot loading. We hypothesized that both metatarsals and tarsals movements of the flat foot were larger than those of the normal feet. However, some makers of the flat foot are larger than normal foot in the forward direction, and are smaller than those in normal foot in the medial-lateral direction in this study. Therefore, we consider that there are difference characteristics of the foot kinematics during the forefoot loading between normal foot and flatfoot. Previous studies of foot movement during weight bearing were divided into three mechanisms which were the “truss mechanism” , the “twisted foot plate model” , and the “mid tarsal locking mechanism” . These models and mechanisms had shown that the rear foot was pronated, and the medial longitudinal arch of the mid- and forefoot was in dorsal flexion, when the body weight was loaded onto the foot. However, the truss mechanism was based on the two dimensional analysis. And in the twisting foot plate model and the mid tarsal locking mechanism, forefoot were represented one segment, while forefoot was consisted with five metatarsals. And these models did not discuss differences in foot kinematics between normal feet and flat feet, and it was considered that flat feet were a result of excessive pronation. Our results of normal feet are shown that all makers exclude the cal-p drop in antero-medially, and the cal-p moved to superior. Moreover, each metatarsal base makers move larger than each metatarsal head maker, respectively. Thus, we find that the calcaneus is inclined medially with plantar flexion and the whole foot drop and incline medially with forefoot dorsiflexion during forefoot loading. Thus, we call the normal feet movement during the forefoot loading “medial inclination”. Sarrafian reported that the foot was similar to a twisted plate. The posterior segment of the plate was compressed side-to-side whereas the anterior segment was compressed in a dorso-plantar direction, and the twisting of the plate determines a longitudinal and a mid-segment transverse arch . Thus, the foot movements we find are nearly equal “twisted foot plate model”. In the flat foot, forward movements of the makers are larger than normal foot with whole foot medial inclination. Decreasing the function of the arch support structure led to collapse medial longitudinal arch without maintenance the rigidity of the foot. Thus, we call this movement with collapse of the medial longitudinal arch structure during the forefoot loading “forward splaying”. A traditional foot orthosis was inserted to limit calcaneal pronation, and to support the medial longitudinal arch using a heel wedge and a navicular pad. These foot orthoses focused on control of excessive foot pronation. However, our results are shown that both the forward movements of the cuboid and medial movement of MTB3 are key movements to control foot kinematics for the flat foot. Lundgren reported that the mobility of the lateral side of the foot (i.e. the cuboid and the fifth metatarsal) was greater than that of bones of the medial side of the forefoot such as the medial cuneiform and the first metatarsal . This indicated that it might be important for the treatment of flat feet to control the stability of the lateral longitudinal arch. In particular, the treatment of flat feet aimed to decrease forward movement of the cuboid, and to increase medial movement of the third metatarsal base may have possibility to improve the foot function for flat feet deformity. This study had a limitation. The subjects of the flat foot group did not have any symptom. It has possible that symptomatic subject show the abnormal movement which is caused by the some pain of the foot, and we cannot find the abnormal foot motions relate to the flat foot. Therefore, we observe the subject without symptom, however patients with both flat foot and some symptom may show the difference foot movement with this study. This entry was posted in Uncategorized and tagged flatfeet, kinematics, lateral longitudinal arch. Bookmark the permalink.